What Is A Safe And Effective Range To Set Your Liters Per Minute Flow Range On Your Oxygen Concentrator & A Simple Way To Check Your Oxygen Levels? If you are wondering how many liters per minute (LPM) your oxygen concentrator flow rate should be set to, or how much concentrated oxygen is safe for you to supplement, you are in the right place. A lot of times people believe that more of a good thing is even better, but that is not the case with concentrated oxygen. In this article we’ll discuss the right settings for when 1 person is using an oxygen concentrator or for when 2 people are using an oxygen concentrator together. You’ll also learn how to check your blood oxygen levels with a pulse oximeter. For a single person that’s looking for relief from the symptoms of altitude sickness a setting of approximately 1 to 2 liters per minute is just about right. The only reason you would want to set the liters per minute to a higher setting is if your doctor specifically told you you need more; Then you’d go with the doctor recommendations. For 2 people using the machine simultaneously you’d want the setting for liters per minute to be approximately 3 to 4 LPM. 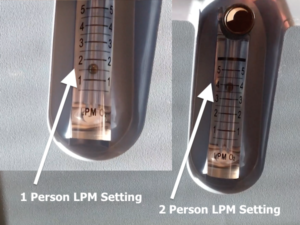 Keep in mind it’s also very important for you to reset the LPM to approximately 1.5 to 2 liters per minute after two people have been using it together and then only one person is going to be using it again. Many people forget this and it’s important to remember so you don’t get too much oxygen when you are using it alone again. Another important thing to keep in mind is that when you are using your oxygen concentrator with another person you’ll be using additional tubing and a splitter to connect 2 nasal cannulas to the tubing in order for 2 people to be able to inhale oxygen at the same time. When you go back to using the concentrator alone, or when somebody else is going to be using it alone after 2 people have been using it together, you’ll need to go ahead and remove the splitter and the extra cannula so that only 1 nasal cannula is connected again. After removing the extra cannula and the splitter you can reconnect your single cannula to the extension tubing with a swivel connector piece, or connect directly to the oxygen concentrator outlet port if you don’t want to use the extension tubing. You need to do this in order to get the right dosage of oxygen as you’ve set it for on your liters per minute setting. Using your pulse oximeter is simple and will allow you to check your oxygen levels while you are using your concentrator and also before so you can see how using the concentrator can change your oxygen saturation. 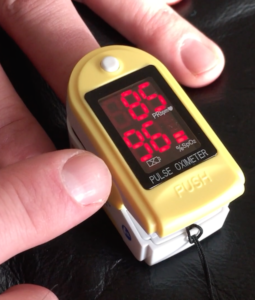 The pulse oximeter is very simple to use. Simply turn it on, insert your finger and wait a few seconds to see your reading. You’ll see 2 numbers, 1 representing your pulse and the other representing your oxygen saturation. Ideally you’ll want to see numbers between 95 and 100%. If your levels are below 90 you have a very low oxygen saturation and it’s going to help a lot when you use the concentrator. Now you know how to check your oxygen saturation using a pulse oximeter and also how to set your oxygen concentrator flow to the right dosage of oxygen whether it’s being used by 1 or 2 people. Call Oxygen Delivers To Get The Oxygen Supplies You Need!